In scenario 1, the reaction of water freezing has which of the following quantities for the Gibbs Free Energy Formula? As water freezes, heat is released. The H value in the equation must therefore be negative. Also as water freezes, there is a local decline in the amount of disorder. The S, or entropy, term in the Gibbs equation refers to entropy of the system. Thus, this term must be negative as well. In any diffusion process, what is ΔG, Gibbs energy? The key here is that diffusion, as mentioned in the passage, is a passive or spontaneous process. That is, it occurs without any energy expenditure, and therefore for any diffusion process, ΔG must be less than 0. In contrast, other transport mechanisms, such as active transport, require ATP as an energy source, and therefore ΔG ≥ 0. In an attempt to better understand the reaction process, she varies the concentrations of the reactants and studies how the rate of the reaction changes. The table below shows the reaction concentrations as she makes modifications in three experimental trials. After beginning the reaction described in the passage, a scientist waits as it comes to equilibrium at standard conditions. He calculates the equilibrium constant to be much greater than 1. Which of the following must be true? If the equilibrium constant of a reaction is much greater than 1, its equilibrium is characterized by having a relative abundance of products to reactants. This ratio implies that the reaction is spontaneous, and can be formally stated in terms of Gibbs free energy. Which of the following conditions will result in a spontaneous reaction? This question tests two distinct, but related, principles: equilibrium constant and Gibbs free energy. In contrast, the reaction quotient is determined by this same equation when the compounds are not in equilibrium. What this means is that a reaction with a reaction quotient greater than the equilibrium constant at a given moment has an excess of products, compared to equilibrium. In contrast, a reaction with a reaction quotient less than the equilibrium constant has a relative abundance of reactions. In this later scenario, the reaction will proceed toward the products in order to achieve equilibrium. An equilibrium constant greater than one indicates that there are more products than reactants at equilibrium, thus favoring the forward reaction and indicating spontaneity. In summary, the equilibrium constant must be greater than the reaction quotient or greater than one in order for the reaction to be considered spontaneous. Evaluating Gibbs free energy is much simpler: a negative value for Gibbs free energy indicates a spontaneous reaction. The equation is always true, and the inequality listed in one of the answer choices cannot exist. A galvanic cell is set up, and is determined to have a standard cell potential of . Which prediction must be true, based on this voltage? There is an inherent relationship between cell potential, Gibb's free energy, and the equilibrium constant. Under standard conditions, a positive cell potential will signify a spontaneous reaction. This indicates that the Gibb's free energy ( ) for the reaction must be negative. It also means that the equilibrium constant must be greater than one, indicating that the reaction favors the products over the reactants. Electrons will always travel from the site of oxidation (anode) toward the site of reduction (cathode), regardless of reaction spontaneity. Which of the following statements is true of scenario 3? It is spontaneous only at low temperatures. It can be used to drive unfavorable reactions. It is spontaneous at all temperatures. It is spontaneous only at high temperatures. The reaction described in scenario 3 is the persistence of fully liquid water in the face of low temperatures. In other words, the Liquid-Solid Water Phase Change Reaction is far to the left. As X must be heat, and there is a shortage of heat in the cold air, the reaction would have to be driven to the right via Le Chatlier's Principle. It could never be spontaneous to the left. If a spontaneous reaction is harnessed to do work, how much useful work can the reaction do? The definition of Gibbs Free Energy is the amount of useful work that a reaction is able to do under defined conditions. It considers the amount of energy that is lost forever to the universe to comply with the Second Law of Thermodynamics. What is the value of ΔG for the reaction below? First, recognize that if ΔG for the formation of ADP is –30 kJ/mol, the ΔG for the formation of ATP must be +30 kJ/mol. Next, we can combine the ΔG of glycolysis with the ΔG of the formation of two ATP molecules (notice the coefficient of 2 in order to balance ATP in the equation). For any given chemical reaction, one can draw an energy diagram. 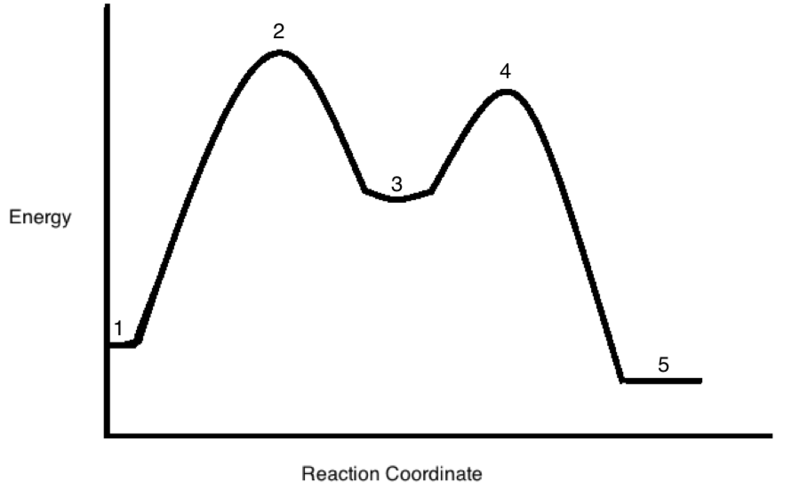 Energy diagrams depict the energy levels of the different steps in a reaction, while also indicating the net change in energy and giving clues to relative reaction rate. Below, a reaction diagram is shown for a reaction that a scientist is studying in a lab. A student began the reaction the evening before, but the scientist is unsure as to the type of the reaction. He cannot find the student’s notes, except for the reaction diagram below. Instead of "Energy" on the Y-axis, the graduate student in the passage instead labels the axis "Heat." In this case, what can we say for sure about the reaction in question? With the change to the chart described in the passage, we know that the system is losing heat from reactants to products (5 is lower than 1). This heat is going out of the system to the surroundings, increasing entropy of the universe. Because of this, the system may either gain or lose entropy. Any entropy losses in the system, however, must be more than balanced by the entropy gained via heat in the surroundings. The universe (system + surroundings) always has a net gain of entropy. Essentailly, since the value for the surroundings will be positive, the value for the system may be either positive or negative, as long at their sum remains positive. Imagine there is an endothermic reaction where entropy is increased in the system. This reaction is not spontaneous at room temperature. What can be done in order to make the reaction spontaneous? The Gibbs free energy equation is written as . Since a negative results in a spontaneous reaction, we can manipulate the variables in order to make the reaction progress. Since entropy is positive in this equation, an increasing temperature will eventually equal the positive enthalpy of the reaction. Once the temperature overtakes the enthalpy, the reaction will be spontaneous. In order to be spontaneous, in this case, . Louisiana State University and Agricultural & Mechanical College, Bachelor of Science, Biochemistry.